Robert Jansen's 24-year life spanned many places: from suburban New Canaan to snowy summers in Canada; to the majestic peak of Grand Teton, Wy., overlooking Yellowstone; the rugged acme of Mount Washington in the White Mountains of New Hampshire; to the snow-capped summits of Mount Shasta and Mount Whitney in California; to the wild reaches of America's great spinal column, the Rocky Mountain chain of Colorado; Robert lived on top of the world. "Mountains were in his DNA," his mother, Peggy, said Wednesday morning. Robert died Saturday, Aug. 25, from injuries sustained in a rock slide near Hagerman Peak, about 11 nautical miles from Aspen, Colo.
On Wednesday, his family gathered in the living room of their New Canaan home where he grew up, remembering the young man who was a son, brother, grandson and nephew. 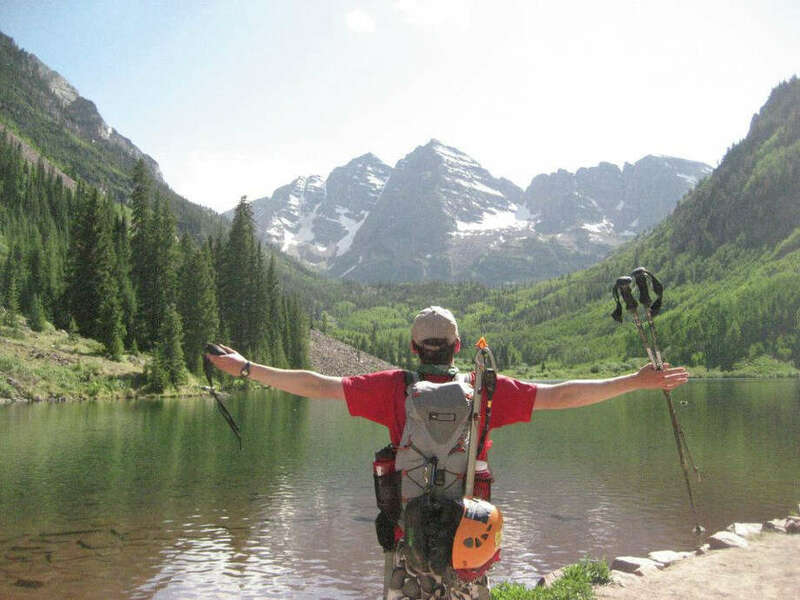 His love for mountains and for the outdoors was apparent from an early age. "He first summited Mount Washington with us when he was 7 years old, which became an annual thing with the family," his father, Bill, said. Mount Washington is the tallest peak in the Eastern United States, and for years held the record for the highest wind gust directly measured at the Earth's surface, at 231 mph. "When he was 6, he summited Owl's Head Mountain (in Vermont) without being carried on shoulders. He was quite proud of that," Peggy recalled. Family members, including Robert's sister, Elizabeth, his aunts Daryl Maass Mathers and Susan Jansen, his grandmother Connie Maass, reflected on Robert's life while his two dogs, Tucker, whom Robert named after Tuckerman's Ravine in Mount Washington, and Annie, rested nearby. He spent his summers at the family residence in Quebec, across the border from Vermont and New Hampshire, and the rest of the year in New Canaan. He attended East Elementary from second grade, then Saxe Middle School. He graduated from New Canaan High School in 2007. As a child he was involved in Indian Guides, a YMCA program where fathers and sons go camping, play games and have cookouts with their "tribes." Robert also loved skiing. His favorite slope was Jay Peak in Vermont, about 5 miles south of the Canadian border. "He would be fully dressed at 6 a.m. with his helmet and goggles on, eating a bagel in the kitchen. The mountain didn't even open for two hours!" Peggy remembered. "He would eat his sandwich on the chair lift because he wouldn't want to take the time to eat in the lodge." "He became a beautiful skier. He did a lot of things with passion," his aunt Susan added. Robert was heavily involved with the Congregational Church of New Canaan for much of his life. He was a member of the church youth group in middle and high school. "I think reaching the top of these mountains was something of a spiritual experience for him," his grandmother, Connie, said. Both parents agreed. In high school, Robert was a three-season varsity athlete in cross country, indoor track and field and outdoor track and field. Robert was a captain of spring track and field, which won the state championship his senior year. Evan Remley was his track coach for four years and his English teacher for two years. "Everyone who ever had the privilege to know him well understood he was a rare person," Remley wrote in an email to the New Canaan News. "Kind without complaint, patient and unwavering, he looked to help all those he knew. I've coached and taught thousands of students in my time at NCHS. But I can close my eyes and picture Rob still, waiting at the track in a rainstorm with a grin on his face or holding a baton against his hip, catching his breath after a relay. As a coach and a teacher, you accept that kids will come and go. But the great ones stay with you forever." After he graduated from New Canaan High, Robert went to Dickinson College in Carlisle, Pa., where he majored in geology. His mother says he was very happy at Dickinson, where he was also a three-sport athlete, competing in cross-country, indoor track and outdoor track. His senior thesis, "Origins of Polymictic Diamict at Kima' Kho, Northern British Columbia, Canada" focused on glacial formations and volcanoes in British Columbia and Alaska. Dr. Ben Edwards taught Robert mineralogy and petrology at Dickinson and supervised his senior research project. "It was probably one of the most integrated projects that we've had in a while." Edwards remembered Robert, "He was always very eager to learn. He took instruction well, tried to also be independent, and wasn't afraid to try things on his own. Those were the sorts of qualities that we look for in students to be successful and go out into the working world. He's a great example of what we hope all our students can do." After graduating in 2011, he moved to Colorado and was hired as a geotechnician at the Bill Barrett Corp., a Denver-based oil and natural gas exploration and production company, where he worked with data on mountains and rock formations. Kurt Reinecke is the executive vice president of exploration at Barrett, and was Robert's boss. "Robert was definitely one of the best. He had caught my eye with his enthusiasm, his desire to put in the extra hours and the extra effort. He was definitely on the rise, moving up through the company. He never said no to anything that was assigned to him. He was always looking to challenge himself," Reinecke said in an interview. Robert's father Bill said Robert loved working at Barrett. "He had many friends at work. He loved his job and he loved the people he worked with." When employees learned of Robert's death at the office Monday, "Most people walked around just in stunned silence, couldn't believe it happened. Several people went home early because they just needed to spend time with their own families and grieve the loss," Reinecke said. As much as he loved work, it's hard to imagine Robert loved anything more than mountain-climbing. Of the 58 mountain peaks higher than 14,000 feet in elevation in Colorado, Rob had summited 53 of them in the 13 months he had lived there. There are only 56 weekends in 13 months. Robert became a prominent member of the mountain-climbing community, which has as its online gathering spot a website called 14ers.com. On this site, members plan climbs, write reports of their trips for other members and discuss climbing and the mountains. Recently, Robert organized a regular happy hour for members of the group to spend time together in person, his mother said. As of 3 p.m. Aug. 29, there were 163 posts, many of them including pictures and heartfelt recollections on a memorial page created for Robert on the site. One of his friends, co-workers and a member of the 14ers site is Dan Pritchard. "He's one of those people that you're lucky a little bit of him rubs off on you. We ran together, we climbed together. He paced my wife at the Leadville 100 last weekend (a 100-mile race through the Rocky Mountains). We ran the Leadville Marathon together, well, not together; he beat me by an hour and a half. I saw him at the beginning." Pritchard continued about Robert, "He was humble, upbeat. He's just one of those guys that you meet every once in a while. You wonder what is parents did that made him that great." On Saturday, Aug. 25, Robert was climbing Snowmass Mountain with four similarly experienced friends. As they traversed from Snowmass Mountain to Hagerman Peak, there was a rock slide. "Three of the climbers were caught in the slide. One climber sustained minor leg and ankle injuries, another a fractured ankle, and our son didn't make it," Bill Jansen said. The two climbers who were above the slide couldn't gain access to where the three were injured. "The climber with a broken ankle couldn't move, the one with minor injuries managed to reach our son who was alive and conscious and lucid. He first asked about the state of his fellow climbers, he was very concerned about their well-being," Bill recalled. While climbers above the rock slide called for emergency aid, Robert talked to his mildly injured companion, Greg Fisher, who was focusing on Robert's well-being while waiting for help. "All the while my son and Greg talked about the state of the other climbers, how they were going to get out, and how they would all fully recover from these injuries. They also talked about the importance of friends and Robert specifically told Greg a lot about his sister Elizabeth, how much he loved her, and the importance of family. He was very positive and very strong. He did not appear in discomfort. They talked for approximately 60 minutes, and the last thing he said was how much he loved his family and Canada. And that was it. Greg remained with him and performed CPR for probably another hour and waited until the rescue helicopter arrived sometime around 8 p.m. and airlifted the four other climbers. Robert was successfully recovered Monday the 27th and was flown to Aspen airport." Peggy said her son was always prepared and cautious when climbing. "He was not a risk taker. He was incredibly diligent with his preparation," she said. "He never hesitated to turn back, which he did many times," Bill added. Both parents were clear that what happened was not a case of recklessness, but rather an accident, a risk of the activity, but not something for which one can be prepared. There will be a memorial service on Saturday, Sept. 8, at 2 p.m. at the New Canaan Congregational Church, 23 Park St. Senior Minister Skip Masback will officiate. There will be a reception immediately following the service at the Roger Sherman Inn. Memorial donations may be made to Mountain Rescue Aspen, at MountainRescueAspen.org; or to the New Canaan Volunteer Ambulance Corps, 182 South Ave., New Canaan, CT 06840.